From England to New York, Italy to Japan, the Spring 2019 Romona Keveža Collection is inspired by some of the most magnificent venues around the world. 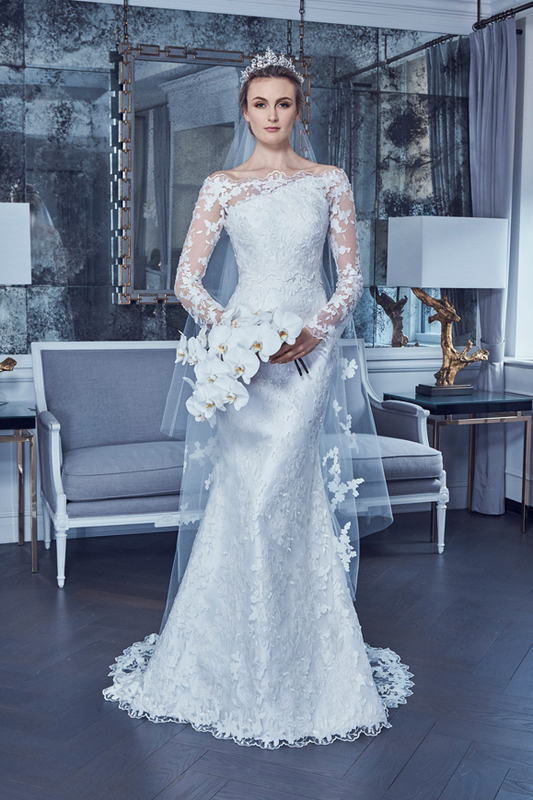 The collection begins with a signature pearl 5-ply silk crepe gown with long illusion sleeves evoking the elegance and sophistication Romona envisions for a Windsor Castle wedding. three-quarter-length sleeves, radiates the refined luxury of a Buckingham Palace wedding. The grandeur of La Scala in Milan, Italy is captured with an iridescent silver silk jacquard ball gown with an off-the-shoulder neckline, accented with a rhinestone brooch and buttons.A wedding at Château de Chantilly in France is beautifully portrayed by a French-Net ball gown with grosgrain detailing. We are then taken to the Sakura Gardens in Japan with a lavender white gown made of Swarovski floral embroidered lace and soft A-line skirt, accented with a matching veil. The collection culminates with an awe-inspiring French embossed satin gown, an ode to the majesty of Versailles featuring a basque waist, column skirt and breathtaking detachable overskirt. The Spring 2019 Romona Keveža Collection embodies worldly sophistication with an undeniable sense of luxury.